Reflecting the diversity of countries in its neighbourhood, the European Union (EU) has established different cooperation processes, institutional arrangements and forums for its discussions with these countries. Each form of cooperation is characterized by its own dynamics, institutional set-up and instruments, procedures, long-term objectives and problems. The various forms of cooperation between the EU and its neighbouring countries also reflect the importance of those countries for the competitiveness of the EU and its Member States. 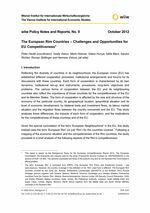 The form of cooperation is affected by the size and structure of the economy of the particular country, its geographical location, geopolitical situation and its level of economic development, by bilateral trade and investment flows, its labour market situation and the migration flows between the country concerned and the EU. This study analyses these differences, the impacts of each form of cooperation, and the implications for the competitiveness of these countries and of the EU. The economic impacts of existing agreements between EU Member States and Rim countries, including in terms of FDI and trade flows. A simulation of various scenarios covering free trade in goods between the EU and some of its neighbours is attempted. Where possible, the effects of bilateral agreements on the growth and productivity of small and medium-sized enterprises (SMEs) in the Rim countries are investigated. The economic impact and the impact on competitiveness of migration and remittances flows between Rim countries and EU Member States are investigated, as is the effect these have on the labour market. Conclusions are drawn and policy recommendations made on the basis of the analysis; these cover the challenges and opportunities for the competitiveness of EU enterprises and sectors in the Rim countries.